“Clusters are geographic concentrations of interconnected companies and institutions in a particular field. Clusters encompass an array of linked industries and other entities important to competition. They include, for example, suppliers of specialized inputs such as components, machinery, and services, and providers of specialized infrastructure. Clusters also often extend downstream to channels and customers and laterally to manufacturers of complementary products and to companies in industries related by skills, technologies, or common inputs. Finally, many clusters include governmental and other institutions—such as universities, standards-setting agencies, think tanks, vocational training providers, and trade associations—that provide specialized training, education, information research, and technical support.” Porter, M., “Clusters and the New Economics of Competition,” 1998. Clusters may emerge at the national, regional, state (provincial), and metropolitan level. And, the more advanced an economy is, the more possibilities there are of developing clusters also at the metropolitan level. 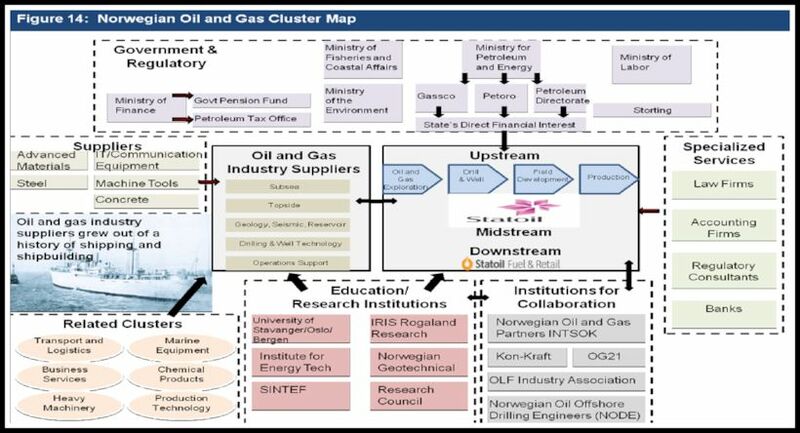 In addition, when considering clusters linked to commodities, the geographic element could assume additional relevance because the geographic location of where extraction takes place is the starting point of the commodities value chain (oil and gas have an upstream, midstream, and downstream phases). But, be it clear that this is not the rule because there are examples of commodities clusters developed at a different stage of the product’s value chain. Think of the Antwerp diamond cluster, which has developed in a city where diamonds aren’t mined but, instead, are cut (less so today, because part of cutting activities has moved to low-wage centers) and commercialized (still today 85 percent of the world’s rough diamonds, 50 percent of the polished diamonds and 40 percent of industrial diamonds pass through the diamond district of Antwerp). Indeed, poor countries don’t have sophisticated clusters. In general, poor countries compete in the world market through the utilization of a cheap labor force and the export of unprocessed natural resources. And when poor countries try to promote the development of economic clusters, they face huge obstacles because they lack the general pillars supporting the emergence of a cluster, i.e., good educational institutions, a skilled labor force, technological expertise, access to capital markets, and good public institutions. These elements are the basic pillars. Then, over time, the embryonic cluster will automatically help the emergence of assets more in line with the specific field of the cluster. Developing a cluster is a step-by-step approach. As Professor Porter of Harvard University Business School explains, in the early stages of economic development, countries must expand their internal trade, which is the trade among the cities and the constituent states (a.k.a. provinces or governorates), and their trade with neighboring countries. These two initial steps, i.e., trading domestically and with neighboring countries, are the cornerstone on which it’s possible later on to build a real cluster. Of course, the goods that poor countries will initially trade will be primarily raw commodities and products produced thanks to the utilization of a cheap labor force. 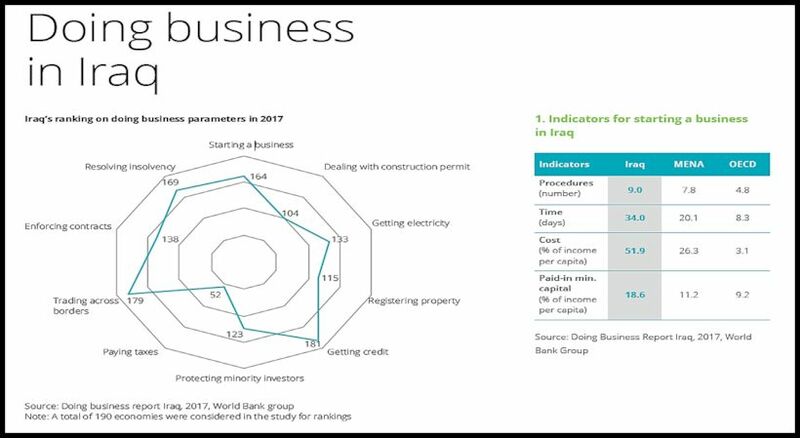 In developing countries, a consistent part of the economic activity is often located around the capital city primarily because of the presence of several factors such as infrastructure, institutions, and suppliers. So, quite often a new cluster might develop around the capital center of a country. At the beginning, this phenomenon might speed up the process because of the presence of the above-mentioned factors. But, on a long-term horizon, and a cluster will always develop over a long-term horizon, the closeness to the capital city might cause many problems such as an intrusive role by the central government, which brings about many dysfunctional outcomes, and higher production costs (think of congestion, bottlenecks, red tape, etc.). IS THERE ALREADY A PETROLEUM CLUSTER IN BASRA GOVERNORATE? Is it possible to define the petroleum-sector operations in Basra Governorate a petroleum cluster? The best answer is that in Basra Governorate there is a very embryonic form of what, if properly developed, could become a real oil and gas cluster. 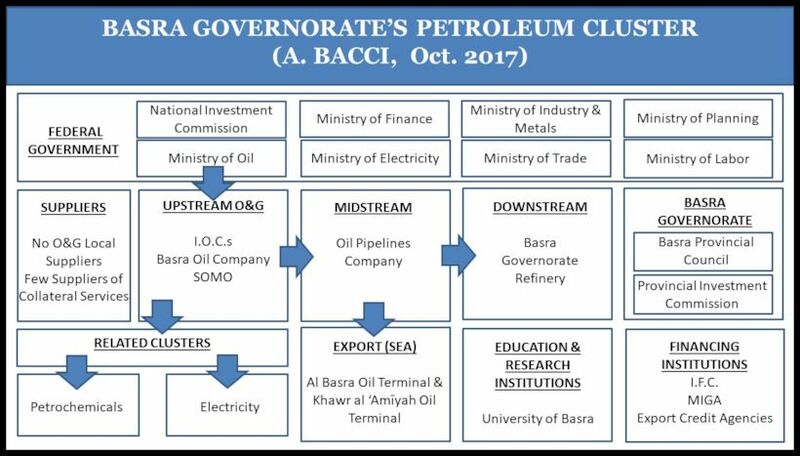 But, for several reasons, Iraq’s petroleum industry has never been capable of overpassing this embryonic stage—actually the most advanced developments have always been in Basra Governorate thanks to its giant oil fields (Zubair was discovered in 1949, Rumaila in 1953, West Qurna in 1973, and Majnoon in 1975) and the presence of the only Iraqi coastline from which oil is exported. Between 1929 to 1961, Iraq’s oil industry was under the virtual monopoly of the Iraq Petroleum Company (I.P.C., previously known from 1912 as Turkish Petroleum Company, T.C.P. ), which had complete control on oil exploration and production. In 1928, it was decided the final shareholder composition of what the following year would be renamed the I.P.C. The shareholders were the Anglo-Persian Oil Company (today’s BP) with a 23.75 percent share, Shell with a 23.75 percent, Compagnie française des pétroles (today’s Total) with a 23.75 percent share, the Near East Development Corporation (representing the interest of five U.S. companies—among them there were Standard Oil Company of New York (today’s Mobil), Standard Oil Company of New Jersey (today’s Exxon) and Gulf Oil (today part of Chevron) with a 23.75 percent share, and Mr. Calouste Gulbenkian, an Armenian businessman, with a nonvoting 5 percent share. Indeed, this company extracted oil in Iraq, but the only goal was to deliver profit to the shareholders coupled with scarce interest in helping the development of a local industrial sector. This was part of the reasons concerning the very tense relationships between the Iraqi government and the I.P.C. between 1961 and 1972, the year of the nationalization of the I.P.C. operations. But, also after the nationalization, despite some initial hope, there has never been the possibility of transforming Basra Governorate into a full-fledged petroleum cluster. In fact, in the last four decades, the Basra region has been a battleground during the Iran-Iraq War and during the two Gulf Wars. International sanctions such as the United Nations (U.N.) embargo after the invasion of Kuwait didn’t help the economic prosperity of the governorate. Moreover, after the 2003 invasion, the governorate one more time became a center exposed to violence with militia conflicts and resistance acts against the Multinational Force and the new Iraqi government. At that time, both simple criminality and sectarian violence increased. Only after 2008, was it possible to recreate a sort of peaceful environment in the governorate. All these wars have damaged the economic infrastructure and have left, scattered throughout the region, a host of mines and unexploded ordnance, which, as a result, necessarily slow the economic development of the region. Basra Governorate is and will continue to be in the coming years the pillar around which will revolve Iraq’s petroleum industry. Presently, the two main problems partially slowing the process of developing Basra Governorate’s petroleum cluster are Iraq’s present technical service contracts (T.S.C.s) and the on-the-ground security risks throughout Iraq. The T.S.C.s, which are established by the federal government in Baghdad, create for the federal government some economic difficulties under low oil prices. In fact, their structure obliges the federal government to repay more or less the same fee to the international oil companies (I.O.C.s) no matter what the oil prices are. And, of course, when oil prices are low, the federal government sees an important reduction in its oil revenue. Iraq has recently declared that it wants to review the structure of the T.S.C.s in order to align them in a better way with the interests of both the government and the I.O.C.s. With reference to on-the-ground security risks throughout Iraq, it’s important to underline that Basra Governorate, despite having been the theater of some terrorist attacks, has been saved from direct and recurrent ISIS attacks, which, instead, have occurred for instance in Dhi Qar Governorate, another Iraqi southern governorate. If anything, because the armed forces left Basra Governorate in order to fight elsewhere ISIS, there has been an increase in non-terrorist criminal acts in the governorate. Its vicinity to most of its petroleum final buyers, which are located in Asia (India, China, and South Korea). Let’s now examine these three advantages one by one. 1 — HUGE OIL RESERVES — Iraq has huge oil reserves and ranks fifth in relation to proven oil reserves at the world level. At the beginning of 2017, Iraq’s Ministry of Oil declared that the country’s proven reserves had increased to 153 billion barrels from a previous estimate of 143 billion barrels. The increased estimate is the result of appraisals and exploration carried out at seven oil fields in central and southern Iraq. At least 60 percent of Iraq’s proven oil reserves are located in Basra Governorate thanks to its five giant oil fields. The whole Iraq has more than 70 oil fields, but only 30 percent of these are developed or partially developed. In this regard, last July, the Ministry of Oil in implementation of its plans announced the launch of a new project to explore for, develop, and produce a number of borderline onshore and offshore exploration blocks and oilfields in south and middle Iraq. In practice, of the nine blocks included in this project, five are in Basra Governorate. They are: the three blocks Khudher Al-Mai, Jebel Sanam (Jabal Sanam) and Al Fao on the Kuwaiti border, the Sindibad block (including the Sindibad oilfield, which is jointly owned by Iraq and Iran, and which could have 3 billion barrels of recoverable oil) along the Iraqi-Iranian borderline, and the Arabian Gulf block in the Arabian Gulf. 2 — LOW FINAL PRODUCTION COST — It’s correct to affirm that there are different qualities of crude oil according primarily to the A.P.I. degrees and the sulfur content (A.P.I. degrees and sulfur content are the main factors establishing the price of a specific barrel in relation to a selected benchmark), but, in the end, oil is a commodity, and as such it’s fungible, which means that the market will treat the produced commodity batches as equivalent or almost equivalent disregarding the location from where the commodity was sourced. In addition, with commodities, producers are price takers, which means that the market price will be the cost required to cover the production cost of the highest-cost producer necessary to satisfy the last barrel of oil required by world demand. 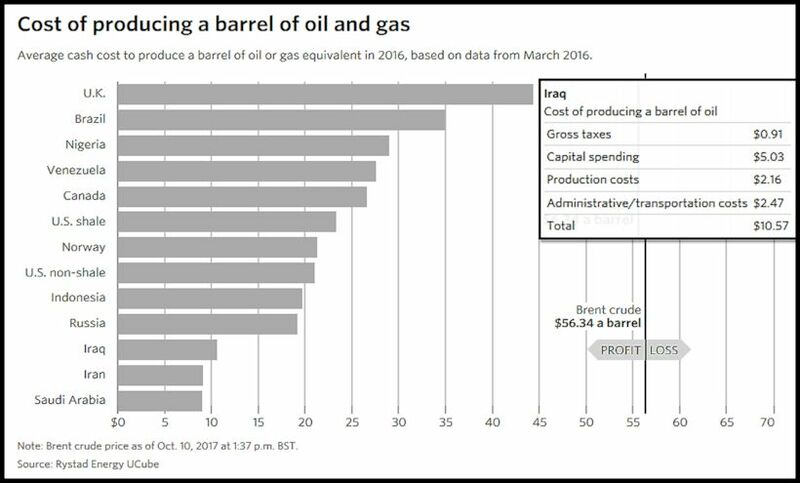 In practice, under a price-taker logic, the best place to extract crude oil will always be the oil-producing countries with the lowest final production costs, i.e., Kuwait, Saudi Arabia, Iraq, and Iran. Also, Russia would have, at least until now, a quite competitive pure production cost, but, then, when taxes kick in, the final production cost almost doubles. 3 — PROXIMITY TO FINAL BUYERS — With reference to trade, distance still matters. Some years ago, Professor Pankaj Ghemawat of Stern Business School developed “The CAGE Distance Framework,” a tool that pictures distance between two trading countries according to four basic dimensions: cultural, administrative, geographic, and economic. These dimensions form the acronym CAGE, and each type of distance influences the different businesses in different ways. When dealing with commodities, some features of the four dimensions are toned down. For instance, one thing is to sell to a country an item that could infringe or touch negatively on the social norms of the purchasing country, another thing is to sell a commodity, like crude oil, which is universally accepted throughout the world. In general, the farther a country is from another country, the harder it will be to do business with that country. Other elements are for instance “the physical size of the country, average within-country distances to borders, access to waterways and the ocean, and topography.” It’s self-evident that geographic distance has a relevant impact when considering communications and the cost of transportation. So, geographic distance could be an important obstacle to trading heavy or bulky products, or products requiring a high degree of coordination between the involved trading partners. Indeed, crude oil has a very much higher value-to-weight (bulk ratio) than for example cement, but still crude oil operations require a lot of coordination and a specific infrastructure. In relation to Iraq’s oil exports, a look at the map well clarifies how Iraq, and this is true of all the Persian Gulf oil producers, may well serve the Asian and the European markets. 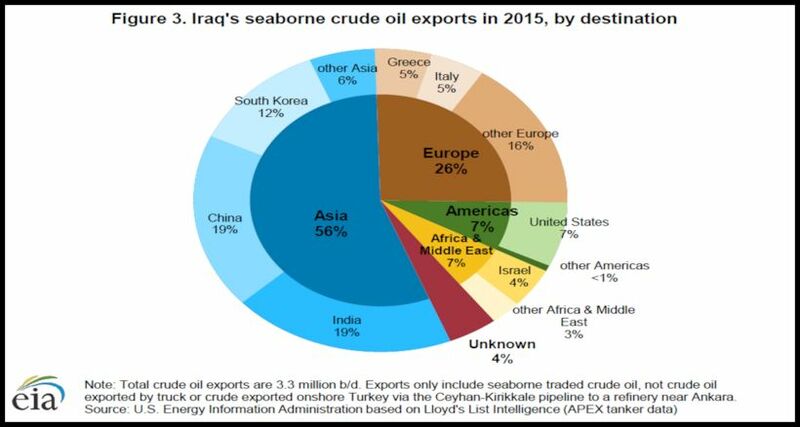 As the pie chart below shows, in 2015, Asia, collecting a 56 percent share, was the main regional destination for Iraq’s crude oil. In specific, India and China both received a 19 percent share, while South Korea received a 12 percent share. The second-most-important market for Iraq’s crude oil was Europe, which received a 26 percent share. In Europe, the two most important buyers were Greece and Italy, both receiving a 5 percent share. In other words, the three mentioned advantages guarantee that Basra Governorate will be of one of the world’s main centers of oil production also in the coming years. And, in light of geopolitical considerations, Basra Governorate will retain this position no matter what Iraq’s future institutional framework will look like. The only real problem, which is common to all the Persian Gulf countries, is a blockade of the Strait of Hormuz. In reality, the possibility of this problem, although remote, has always been present since at least the Iranian Revolution in 1979, but it never refrained national oil companies (N.O.C.s) and international oil companies (I.O.C.s) from working in the Persian Gulf. 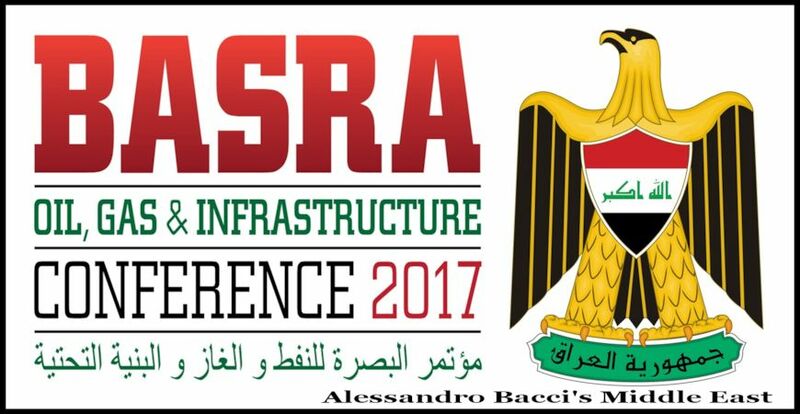 So, investors should be reassured that investing in Basra Governorate is a viable option. Once it’s understood that Basra Governorate has abundant and cheap oil reserves close to its relevant markets in Asia (and in Europe as well), it is quite normal that the next step should be to develop what today is a sort of embryonic petroleum cluster into a more defined petroleum cluster, which could serve in a better way the interests of Iraq’s petroleum sector for the coming years. OIL & GAS REGULATORY FRAMEWORK — One first point to understand when talking about the development of a petroleum cluster in Basra Governorate is that we are examining a regional cluster whose main business activity is petroleum production, which is instead granted and regulated at the federal level. 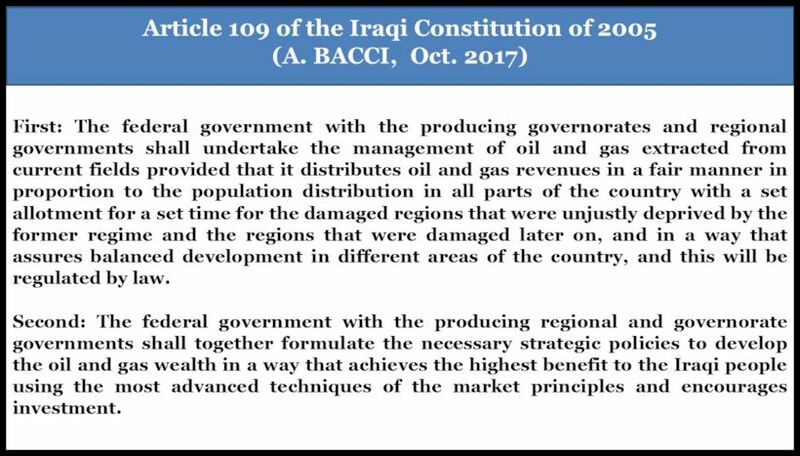 In fact, the legal framework regulating petroleum activities in Iraq is based on some very general provisions in the Iraqi Constitution of 2005 (in specific, on Article 109). The Oil Ministry has the control and oversight over oil and gas exploration and production in Iraq. Since 2009, the ministry has held four licensing rounds, which have resulted in the signature of a number of T.S.C.s with several I.O.C.s. The signed T.S.C.s have formed unincorporated joint ventures each including I.O.C.s and one of the Iraqi state-run petroleum companies. Presently, there is no royalty, although the idea is that a 12.5 percent royalty will be introduced by the Federal Oil and Gas Law, once this is approved. Corporate income tax (C.I.T.) is capped at 35 percent. Petroleum companies operating in Iraq are subject to Law No. 11 of 2010 for the protection of local products (limits to the import of goods if these are manufactured in Iraq as well) and, according to Law No. 13 of 2006 (Investment Law) have to give priority in recruiting and employment to Iraqi workers. Moreover, companies operating in Iraq need to open a branch in the country. With reference to transportation of crude oil and associated products, the Oil Pipelines Company, which is a state entity under the Ministry of Oil, owns and maintains the pipelines, marine vessels, and tanker trucks used for these operations. All internal and external sales are conducted by Iraq’s State Organization for Marketing of Oil (SOMO). The governorates don’t have authority over the oil revenue and depend on the federal government’s revenue transfers. It’s the State Budget Law that determines the amount of revenue shared. Specifically, funds are transferred on the basis of the Regional Development Program transfers, the petrodollar allocation, and for the Kurdistan Regional Government (K.R.G.) some specific transfers. The first ones are linked to the governorates’ population. The second ones consist in a monetary compensation for every barrel of oil produced, for every barrel of oil refined, and for each 150 cubic meters of natural gas produced by every governorate—the K.R.G. is excluded from the petrodollar allocation as well as Diyala Governorate and Karbala Governorate, which don’t produce oil. It’s evident that industries strongly dependent on the extraction and export of natural resources have a reduced necessity to innovate and upgrade than have for example the communications or the pharmaceutical industry. But, it’s also true that an improved competitiveness always advances positively the economic results of industrial sectors based on natural resources as well. Norway is a good case in point. Today, it has developed a competitive oil and gas cluster, and its companies have internationalized and compete at the world level. Statoil, Norway’s multinational oil and gas company has now operations in 36 countries. 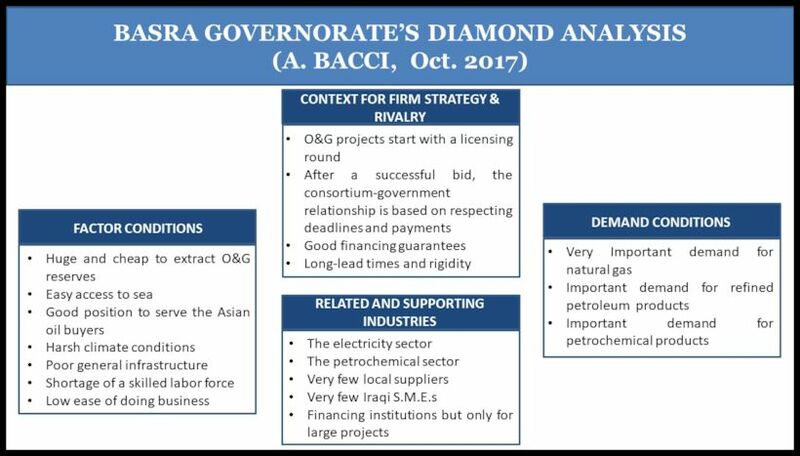 An analysis of the Diamond of National Competitiveness, in our case, an analysis of the Diamond of Basra Governorate Advantage, with its four attributes—1) Factor Conditions, 2) Demand Conditions, 3) Related and Supporting Industries, and 4) Firm Strategy, Structure and Rivalry—well explains where the competitive advantage is for Basra Governorate. With reference to FACTOR CONDITIONS, it’s possible to notice how here lies the real competitive advantage of Basra Governorate—although when there is an important supply of raw materials, governments and companies could rest on these and do business as usual. Iraq ranks fifth in relation to proven crude oil reserves with 153 billion barrels, of which around 60 percent are in Basra Governorate. Similarly, Iraq ranks 11th in relation to proven natural gas reserves with 3,7 trillion cubic meters of natural gas, of which around 70 percent are in Basra Governorate. These crude oil reserves are also very cheap to extract. The presence of a natural access to the sea is then of paramount importance for the export of products from Basra Governorate. The ports of the governorate (in specific, the two oil terminals) are perfectly positioned to serve Asia’s petroleum buyers. Basra Governorate’s climate conditions are harsh because the governorate has a hot desert climate. In the summer, Basra Governorate is one of the hottest areas on the planet with temperature regularly exceeding 50 degrees Celsius. In addition, the frequency of dust storms has increased drastically in the last decade. Dust storms have a very harsh impact on both human’s health and economic activities. Dust storms, if severe, might disrupt the operations of crude oil loading at the Basra oil terminals. The conditions of the general infrastructure are not good. Houses, roads, and hos­pitals need all consistent improvement because of the violent acts and the poor maintenance of the last forty years. Access to clean water, electricity, roads, and sewages remains limited. For instance, the city of Basra has a complex network of canals and streams, which historically were used to transport goods and people throughout the city, but pollution and a reduction in the water level have rendered navigation impossible. According to the World Bank’s Ease of Doing Business, a report tracking changes in regulations affecting 11 areas in the life cycle of a business, Iraq (and this is true for Basra Governorate) is ranked 165 out of 190 countries. In specific, Iraq needs to speed up the procedure to start a business, to get credit, to trade across borders, and to resolve insolvency. Skilled labor is scarce because of the deterioration of Iraq’s public education institutions (schools and universities) sapped over the last thirty years of the proper financing amid tough sanctions, the 2003 invasion, and the sectarian fights. Instead, before 1991, Iraq had one of the best educational systems in the Middle East. With reference to DEMAND CONDITIONS, crude oil extraction is primarily carried out to export it to foreign destinations, but at the same time, Basra Governorate’s associated natural gas—two thirds of this gas is still flared—will assume always a more preponderant role in generating electricity in Iraq. There is an already important demand for natural gas as feedstock to some power plants, which technically should run on natural gas, but, because natural gas is not available yet, they run on fuel oil. Current power generation in Iraq, now at 13 gigawatts, makes up only a quarter of the demand (around 42 gigawatts)—the oil and gas industry is the largest consumer of electricity. So, there is an important potential demand for natural gas, which until now hasn’t been satisfied because of many infrastructural and policy gaps. In practice, the low natural gas price and the bad (or in some cases non-existing) infrastructure to transport it make investments in the gas sector not very interesting to the private sector considering the low profits. It would be necessary to increase the price of gas and/or to privatize the distribution of electricity because in this way it would be possible to incentivize natural gas investments, but this decision has been postponed until now for fear of popular protests against these unpopular moves. The government, via its state-owned South Gas Company, purchases gas from the companies at prices higher than the prices at which it then resells the gas to the final consumers. On a long-term basis this is unsustainable. According to Shell, in 2013, this wasted demand for natural gas would have generated 4.5 gigawatts capable of covering the needs of 3 million homes. Importing Iranian natural gas into Iraq, which flares its own natural gas, is indeed quite strange. At the same time there is a request for refined petroleum products (the downstream part of the oil and gas value chain). According to the U.S. Energy Information Administration (E.I.A. ), most of Iraq’s petroleum consumption comes from the country’s internal oil refineries, but at the same time the country must import around 100,000 b/d of petroleum products. It would also be economically appealing to Iraq to enlarge its petrochemical industry, which is an industry related to the oil and gas cluster, both for the domestic consumption and for exporting petrochemical products to Asia. With reference to CONTEXT FOR FIRM RIVALRY AND STRATEGY, it’s important to make a distinction concerning projects under public direction in Iraq. On the one side, there are the projects in the petroleum (oil and gas) sector (upstream, midstream, and downstream) under the direction of the federal government through the Ministry of Oil, and the projects in the electricity and petrochemical sectors, which are industries related or supporting to the petroleum sector, under the direction of the Ministry of Electricity and the Ministry of Industry and Minerals. On the other side, there are projects under the direction of the Basra Provincial Council with attention given to agriculture and certain sectors of the economy that are out of the federal jurisdiction. As for the petroleum projects, the interested companies normally proceed through licensing rounds. And it is at the tender level that rivalry among the companies interested in developing a project is carried out. In the petroleum sector, where the government has organized four licensing rounds from 2008 until now, the consortium winning a licensing round is constituted always by I.O.C.s (but there may be also only one I.O.C. in a consortium, as it is now the case in relation to West Qurna 2 with Lukoil) and an Iraqi state-run petroleum company. So, once, a license is assigned, it’s not any longer a matter of rivalry, but it’s more a process of respecting deadlines and implementing the correct payments among the involved parties. Projects pertaining to the petroleum sector (oil and gas)—but this is true also for the related or supporting industries such as the electricity and the petrochemical sector—all involve relevant capital investments. This means that most of the companies involved in these projects are large and financially sound companies with a wide portfolio of investments. Moreover, because especially in the oil and gas sector, projects are carried out by consortiums, it takes a long time between the ideational phase of a project and its implementation. Summing up, on the one side, there are good financial guarantees, but on the other side, there are long-lead times and rigidity in the implementation among the involved parties. With reference to RELATED AND SUPPORTING INDUSTRIES, there are at least two big industrial sectors linked to the petroleum sector in Iraq. They are the electricity and the petrochemical sectors; their projects are carried out via tenders. In general terms, these two sectors are the necessary corollaries to a large petroleum sector as the one present in Basra Governorate because they permit a country to monetize in a better way on the extraction of oil and gas. The problem in Basra Governorate is that there is the need that these two related/supporting sectors are fully developed as soon as possible, but for the time being they are still in their infancy. Basra Governorate, in behalf of the whole Iraq, needs more gas-fired power plants and more petrochemical factories. In addition, there are very few local suppliers, especially in relation to maintenance and of course all the issues involving machinery components. This is a real issue because often the contracts in the petroleum sector as well as in the two above-mentioned related sectors have strict local content requirements, such as provisions given to Iraqi workers for employment and to locally produced goods and services. Part of the problem of the lack of local suppliers is related to the difficulties that Iraqis have in securing loans from the local banks in order to finance the creation of Iraqi small and medium enterprises (S.M.E.s). Banks need collateral guarantees, but if the applicant doesn’t have them, it will be impossible for the applicant to secure a loan. Instead, larger projects can benefit from bilateral and multilateral assistance in forms of loans and grants from development financial institutions (for instance the International Finance Corporation and the Multilateral Investment Guarantee Agency—both institutions are members of the World Bank Group) and the national export credit agencies.